Habitat: Desert, Riparian. This weed typically grows in urban lawns and gardens and in disturbed areas where it can get some extra water. Description: The flowers are borne singly in the leaf axils. 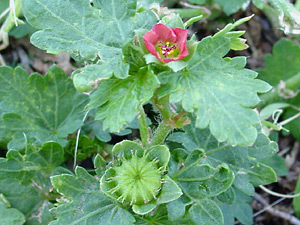 The individual flowers have 5 broad petals. 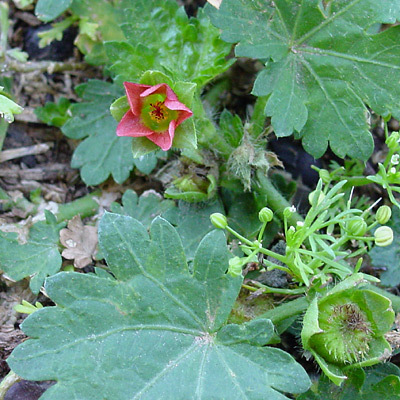 The flowers are followed by wheel-shaped fruit with 2 spines at the edge of each wheel section. The fruit is initially green but matures to black. The leaves have toothed margins, 3 to 7 narrow to broad lobes, and are variably reniform (kidney-shaped), round, or triangular in shape. The plants are low-growing and spreading. 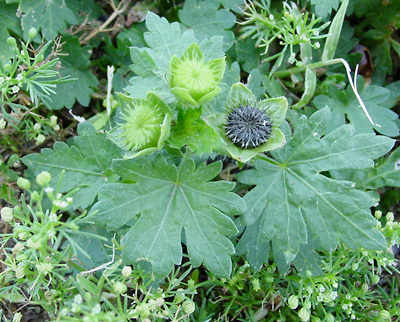 Poisonous – This plant is poisonous, so do not allow animals to graze on it.